The unmistakable Mass_Prod is back! The Italian-American who settled in Zurich is back on Bosconi, a wonderful workshop success. Unmistakable because it would be possible to recognize among a thousand analog style, appreciated by the various Picone and Alicante, with which it shares the same productive characteristics. The first track delves into the deep world, a world in this case smooth, slow, muffled, kind, a record that goes back to the almost melancholic melodies of the years of disco music, in any case keeping his distance from those years, musically speaking. A precious jewel that will delight anyone who appreciates the creations of an analog time. "Cornelinda" instead changes clearly the setting: you get to Detroit, Boo Williams is always present, it's techno, hard, rough, which draws more the Bosconi Grooves EP, another Mass_Prods show. Then we find "Wacko", experimental and abstract, a record influenced by the 2step and speed break. An excellent conclusion for amazing output, even if slightly lower than the two previous albums. 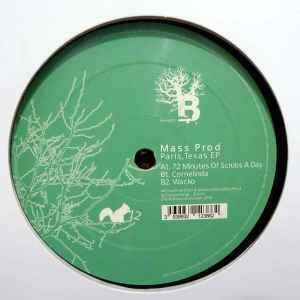 Bosconi and Mass_Prod do not disappoint, the standards are high and the ability to pass from the deep / dub techno to Detroit of older memory, even through contamination by the English 2step, give the label and producer the honorable credited of creating this without falling into banality: despite the references to the old school, none of this seems to make us say "already heard". Cheers and hats off!